Most merchandise can be returned within 30 days from date of purchase providing it is in excellent (new) & salable condition. ALL returned products must be complete; this includes pump adapters (spouts) as this is part of the pump. Any returned order that is not complete is subject to a delay in credit until we receive all products parts. FREE SHIPPING orders will have the original shipping cost deducted from your order. ALL returns need an authorization BEFORE the product is returned. ALL UPS refused deliveries are subject and will be charged the return fee cost. This is the customer's responsibility. NOTE: Packaging & Shipping charges are non- refundable. A 10% Restocking / Processing fee will be applied on all returned products under 15 Days. Returns over 15 Days will occure a 15% Restocking/Processing Fee. NO Returns after 30 Days, No exceptions. 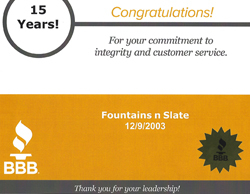 Fountains n Slate reserves the right to discount refunds due to unauthorized returns and/or missing product parts or broken parts. These discounts will be taken from your product return amount. Fountain pumps have a 1 year factory motor warranty excluding Battery Operated Pumps. Pump impellers are NOT under factory warranty. Please contact us if you have a pump that needs an impeller. Pumps that are under warranty and are to be shipped back to us by the buyer. The buyer is responsible for shipping costs back to us. There must be ALL paper work included in the box. Once we receive the pump/pumps we will honor the warranty claim. Warranty pumps being shipped back to the buyer will ship free at our company's discretion. You must have the original invoice for all returned pumps. Warranty is excluded for pumps being misused or altered wiring or being allowed to run dry. Pumps with the power cord altered in any way are non-refundable. Example, cutting the power cord or adding a power cord. Any fountain bowl that is broken, cracked or leaking due to shipping damage MUST be reported within 24 hours from date of receiving your order as this has to be reported to UPS so we can expedite your new shipment. After 24 hours we are under no obligation to replace a product as this is NOT a shipping damage issue as ALL bowls are checked before leaving here. All our slate, custom, One-of-a-Kind Fountains, bulk and lava rock orders are "Special Orders". Therefore we cannot accept any returns on these orders. ALL sales are final, NO exceptions. If you have a question about a return, please email us to confirm our policy.